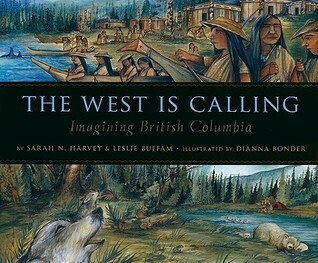 "Combining evocative haiku, informative text and luminous illustrations, The West Is Calling is a celebration, for our youngest readers, of one hundred and fifty years of British Columbia's history. Each detail-rich illustration depicts a particular moment in the province's dynamic saga, from pre-contact Haida culture, to the natural resources-fueled economic boom in the 1960s and beyond, to Expo 86, to the opening up of the North and the growing appreciation of First Nations' traditions." My kids really surprised me with some thoughtful and insightful poetry. They are excellent writers, and I knew that, but this lesson reminded me how powerful poetry can be for young writers. Even my reluctant writers came up with some beautiful poems. You can find this lesson on TPT by clicking the photo below. 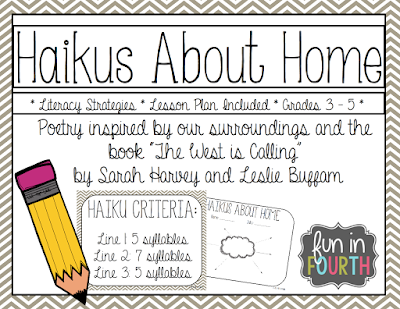 The task is to create a Haiku about your home – students may choose a narrow topic, such as their actual home, or go wider to town, or province. They are provided with a criteria sheet, brainstorming sheet and two choices for a good copy sheet. A marking rubric is also included as well as samples from grade 4 students.